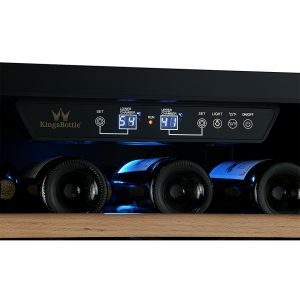 KingsBottle KBUSF54D is a 24-inch size, great quality, vibration-free and quiet, two-zone, built-in under the counter type wine cooler. It is suitable for use by both the casual wine enthusiasts or pro wine collectors. It has a 5.44 cubic feet (154 liters) or 44-bottle capacity in its dual zones and this is valid for regular size and shape Bordeaux type wines. With a front venting heat dispersion, it is designed as a built-in under counter unit as part of a customer cabinet in the kitchen. It can be built in with as little clearance as possible thanks to the low noise fan-circulated air cooling and front ventilation. But there is no reason why you can not use it as a stand-alone wine cooler as it is quite easy on the eyes. The dual zone design means you have two temperature zones and you can set the temps through the digital display panel at the top. The temperature range for the upper zone is between 41 and 54 degrees Fahrenheit and the lower zone temp range is 54 to 72 degrees. It operates well at room temperatures between 32 and 100 degrees Fahrenheit. You can store your white and red bottles at their optimal serving temperatures. You have two beech hardwood shelves in the top section and four of those at the bottom. They’re all warp resistant and have the steel ball-bearing rollers so they slide in and out very easily and smoothly. It has a blue energy-efficient LED lighting inside so you can see the contents clearly. It runs quietly with less than 39 dB noise level thanks to the very modern DC fans and great quality 100 watt R600A compressor (115 Volts) that is stable and offers power efficiency with 0.03-kilowatt hours of energy use (0.83Kwh per day), to help lower your energy bills. The glass door is made up of three layers with two Low-E stainless frame, both of which help keep the internal temp stable and prevent any potential fogging. KingsBottle KBUSF54D weighs 121 pounds and measures 23.6 x 23.4 x 33.9 inches, has a right door hinge and can be used as both a built-in and freestanding unit. It is an ETL certified product, which means it complies the North American safety standards. 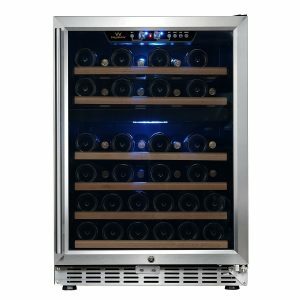 KingsBottle 24” Wine Cooler is not a particularly cheap product but you’re getting quality, durability, functionality and more from such a reliable brand. And it is offered with a parts and labor warranty of two years by the manufacturer along with a hundred percent satisfaction guarantee.